Srinagar, Aug 28 (KNS): Farooq Ahmad Lone, Secretary Social welfare Government of Jammu and Kashmir today inaugurated a two-day ‘Improvised Accessibility and Mobility’ camp at Indoor Stadium here. Speaking on the occasion, the Secretary Social welfare stressed on initiating joint efforts to ensure that the disabled persons get better accessibility to all necessary services in a more pragmatic manner. “Such camps provide us with an opportunity to peep into the past endeavors and recognize our shortcomings for further improving the services towards these special people,” he said. Interacting with some of the differently-abled persons, Lone said that society needs to understand that children with disabilities have great potential and if given an opportunity can contribute remarkably in all fields. Commissioner for Persons with Disabilities (PwDs) M. Iqbal Lone said that the Government is very keen for the welfare and empowerment of the disabled persons in the State. He said that aim and objective of the camp is that the persons with the disability can get themselves registered for providing artificial limbs free of cost and will avail the benefits of several schemes. Today we covered 83 beneficiaries and are expected to cover more tomorrow to complete this camp. 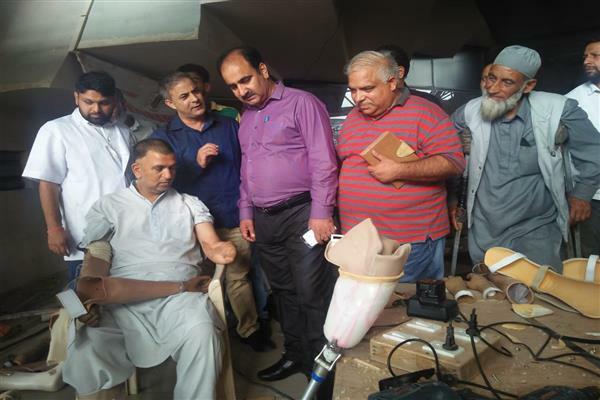 The Coordinator of the Camp Shameem Ahmad, who is also Incharge of the Composite Regional Centre (CRC) Srinagar, said that on the first day around 83 disabled persons were registered in the camp and were checked by a team of Doctors and have be provided with necessary required artificial limbs. Director Social Welfare, MD ICPS and MD ICDS and other officers of allied departments supported this initiative by providing logistical support for this camp and media persons were present on the occasion. Initiatives like this is very important for disabled community who are always dependent on such equipment and we have seen first time such initiative with this much of attendance said Nisar Ahmad , disabled person from Anantnag , the Naira Ali one beneficent from Gandarbal was excited to get her limb free of cost . All the beneficiaries who got benefitted today are part of the overall framework we are working at commissioner ate said one of the official from commissioner for persons with disabilities.